IT service providers often offer pricing models that are broken down per-device, per-service, per-user, and an all-inclusive subscription model. Since managed service providers charge for their services using several pricing models, it’s wise to evaluate what the essential needs of your business are in order to get the best bang for your buck. As your business starts to take off, your IT support will need to increase as well. Navigating both where your business is headed and how to manage that growth with proper IT support can be a delicate balancing act. So often, business owners tend to focus on growing their business rather than on their IT support, leaving their company open for easy attacks from online predators. What exactly do businesses need to look for in a managed IT services provider? The first thing to look for is an IT support provider that has a proven track record of hiring and employing properly trained employees that are well versed in both IT and the company’s vision. Look for company reviews with remarks stating that their staff is furnished with the right skills and experience to successfully execute all the expected IT tasks. Another important item to look for is their certifications from top IT trade organizations, such as the Computing Technology Industry Association (CompTIA) or Microsoft Certified. These credentials are proof that the IT company takes training their team seriously. Another important factor to look for when finding the right IT provider is how quickly and effectively they respond to your company’s needs. Normally you can find this out by asking about their help desk software and ticketing system. A capable ticketing system that has a history of correctly prioritizing IT glitches is necessary for a fluid IT support team. The better the provider’s help desk and ticketing system, the more efficient the managed services provider will be. They should demonstrate a good system of keeping track of all their tasks and assignments. That way, your IT issues won’t get lost in a heap of paperwork lying on someone’s desk. Too often the majority of a businesses’ IT budget goes to unexpected expenses. This puts a strain on making crucial planned improvements. You can’t purchase new computers or software when you need it. Your employees aren’t productive and there’s a higher rate of frustration in the workplace. 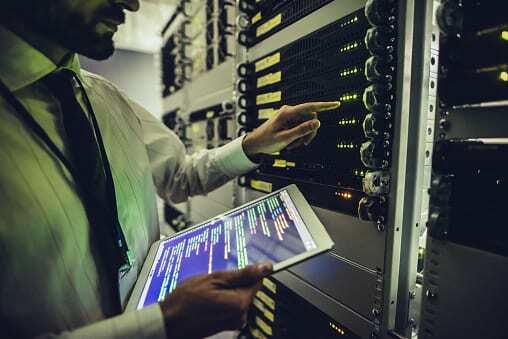 Fortunately, a good managed IT service provider will offer managed services at a fixed rate to ensure your business runs efficiently and affordably. A necessary service for most companies is fast IT support. You never know when servers or computers might break down. Who can you call for any problem? Will they get there right away? When combing through a company’s review section, look for their quick response rates and their on-site support. A good IT provider will be adept at hiring experts in their respective fields that they can turn to when you have a problem. Much of the time, managed service companies can remotely diagnose and repair common errors. However, some issues cannot be resolved remotely and need to be handled on-site. Look for a company that has a reputation for being there when you need help. They should work to establish and nurture a good business relationship with you by responding quickly to your IT needs. With the emergence of cloud technology, protecting your company’s data is essential. Just about every business now relies on data acquired through different means. Today, almost every IT provider offers data backups as part of their service. They normally offer different pricing options based upon the frequency of backups and the incorporation of other cloud-based services. Just like disaster recovery planning, routine backups provide insurance against all types of disasters. It simply makes sense to back up your data frequently to avoid any type of threat to your company’s files. Cyberattacks are becoming more prevalent and causing major disruption and damage to even the strongest of companies. Hackers can easily breach outdated software after determining the unpatched software’s security flaws. Look for an IT services provider that has a proven track record of not only monitoring a company’s cybersecurity, but regularly testing it as well. A good IT services company will keep all software updated and secure. IT consulting companies manage large data centers and put multiple layers of protection in place, but companies can still be breached by hackers. All it takes is one careless employee who clicks on the wrong email attachment. Employee training is a must these days. And it usually works better if you can provide quarterly training for employees. They do get busy and forget and this can result in disaster. Keeping up with the ever-changing world of information technology means exploring new solutions as they become available to your business. When searching for the right IT services provider for your business, look at their years of experience. Check the type of industries they have worked with. Read over their client’s testimonials and reviews. When setting up a meeting with the IT company, make sure to have a summary of your business needs on hand. Come armed with a thorough list of questions for the IT consultants. With in-depth research, you will be able to determine the right IT managed services provider for your business.